Almost unchanged from its recent incarnation on the PSP, Chinatown Wars doesn't offer just a scaled down hand-held distraction from its console counterparts or the usual 'five minutes of fun' app. Here we have a fully blown, fleshed out, hustlin', bustlin', Liberty City for you to play with in the palm of your hand. From the pedestrians to the traffic, the day and night cycle to the weather effects and the street crime to the car chases, this version of Liberty City is most certainly alive and most certainly kicking. For this brush with the law, the viewpoint has switched back to a birdseye perspective, much like the original GTA. The story is once again told through a number of missions, given by various wheeler dealers up and down the city, the variety of which is staggering. 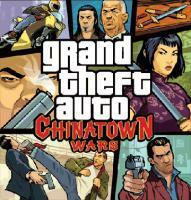 Whether it's escaping arrest under the guise of a dragon float in a parade or sabotaging cars before a race, Chinatown Wars certainly offers the spice of life throughout its lengthy campaign. Missions are perfectly in tune with the mood of the game and take full advantage of the touch-screen controls, immersing you completely into your life of crime. Alongside the main story there are a plethora of side missions to keep your thumbs in motion. With quick taxi, ambulance, police and fire engine missions, started through the acquisition of the said vehicles, there is also the intricate narcotic economy that plays throughout and expands on the already extensive gameplay. Using the unique touch-screen interface, Chinatown Wars puts you in control via an imitation thumbstick directing you around the city whilst driving is simplified to left, right, accelerate and break commands. Everything works intuitively and the controls adapt to the onscreen action making getting around the city a breeze. One large gripe is that without physical buttons to feel beneath your thumbs, sometimes you’ll press the wrong area of the screen and send your car careering into a hedge. On top of this, due to all the controls being on the screen, things can get a little cluttered with fingers and thumbs occasionally obscuring the onscreen action. The frame rate can also become a little choppy at times. Another new feature, exclusive to the iPhone, is the ability to set your own playlist from iTunes as the soundtrack to the game via the Independence FM radio station option. This can give Liberty City any mood that takes your fancy and allows you to play and listen in perfect harmony. Making a welcome return are the touch screen mini-games featured in the original DS version. Ranging from hot wiring cars to smashing windows and assembling sniper rifles, each game adds a definite change of pace to the play and a charming way of interacting with the world. Combining the touch-screen mini-games from the DS and the additional missions and upgraded graphics from the PSP, the iPhone version of Chinatown Wars is a fantastic port of an already exceptional game. With Independence FM making it unique and a price tag that is less than a third of its hand-held rivals, there is no reason not to get downloading this app which is sure to keep you entertained far beyond your journeys to and from work. If ever proof was needed that the iPhone can hold its own in a competitive hand-held gaming market, that proof is right here. Wow, what a disappointment. I actually thought you wrote that.... i was going to compliment you for and excellent first post. If I had an iPhone GTA CW would certainly be the first app I get. But I'm not likely to get an iPhone anytime soon. I have have GTA CW for DS and PSP so I wouldn't be in a hurry to get an iPhone. My current cell phone still works for me and it doesn't have any games. For those that do have an iPhone I recommend CW. Great game all-around.